Are NIH Budget Cuts Really to Blame for the Spread of Ebola? Federal Public health executives on Thursday faced off against lawmakers angry over their fitful response to the Ebola crisis by announcing new countermeasures and by disagreeing with proposals by House Republicans for an immediate travel ban on flights from three West African countries where the virus is raging. By request of Texas Health Presbyterian Hospital, where the first Ebola patient in the U.S. died, the National Institutes of Health will take on treatment of Nina Pham, the first nurse who contracted the Ebola virus. 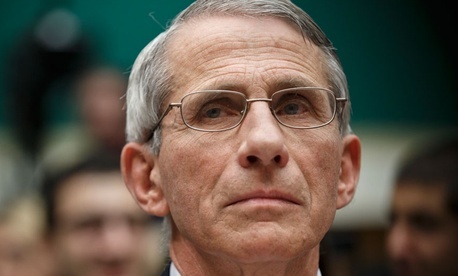 She will receive state-of-the-art care at a high-level containment facility, the NIH Clinical Center, occupying one of only two beds available in this special facility, said Dr. Anthony Fauci, director of the National Institute of Allergy and Infectious Diseases at NIH. Moments later came testimony that a sister agency, the Health and Human Services Department’s Biomedical Advanced Research and Development Authority, is accelerating the search for an Ebola vaccine through an infusion of $5.8 million and subject-matter expertise to a Baltimore contractor Profectus BioSciences Inc. The company will manufacture a vaccine for safety studies in animals and future clinical trials so that HHS can speed it toward trials with human subjects and eventual approval by the Food and Drug Administration. “We are pushing hard to advance the development of multiple products as quickly as possible for clinical evaluation and future use in preventing or treating this deadly disease,” said BARDA Director Robin Robinson. “Our goal is to close the global gap in vaccines and therapeutics needed to protect the public health from Ebola as highlighted by the epidemic in West Africa. Upton, on a day when President Obama canceled a fund-raising appearance and prepared to sign an executive order on Ebola policy, said he was “glad to see the president off the campaign trail to face the crisis. But this is not a fail-safe system,” he said, calling for a travel ban on flights from Liberia, Guinea and Sierra Leone. CDC Director Dr. Thomas Frieden said his team was on the scene in Dallas the day after Duncan’s diagnosis was confirmed in late September. “We know how to control Ebola” he said. “It requires finding patients promptly, isolating them, and identifying and monitoring their contacts. But there are no short cuts in controlling Ebola. It’s not easy,” he added. The key is to stop the virus before it spreads more widely in Africa—where experts fear it could claim 1.4 million victims by January, Frieden said. “We are working 24/7 to protect Americans at multiple levels,” including country exit screening, arrival screening by Customs and Border Protection, raising awareness among American physicians, working with labs and fielding calls to CDC. “We can’t be everywhere, [but] will do everything we can to support the front line,” he said. The reason not to impose a travel ban, Frieden said is that “right now, we know who’s coming in and can track” the estimated 150 individuals per day who travel from the impacted zones. “If we eliminated their flights, they would travel overland to other places and then to the U.S., and we wouldn’t be able to take their history and detailed localized information. We wouldn’t be able to impose a controlled release and monitor their contacts,” he said. That view was echoed by Fauci and by John Wagner, acting assistant commissioner of Customs and Border Protection’s Office of Field Operations. Under a flight ban, his agency, which as of this week is performing full screening of passengers arriving at five major airports, “could use airline data to see where the traveler originated, but it’s more difficult, and it’s easier to manage if the traveler” is reporting his situation voluntarily, Wagner said. Democratic lawmakers also oppose travel bans. “There is no such thing as Fortress America when it comes to infectious disease,” said subcommittee Ranking Member Diane Degette, D-Colo. She challenged CDC, however, for apparent inconsistencies in its protocols for when health care workers should wear full protective gear in which no skin is exposed. Frieden said the policy is highly variable by circumstances. Rep. Peter Welch, D-Vt., called for a second hearing on health agencies’ budgets and authority. Frieden responded that CDC might use some more emergency procurement flexibility.